Available on Amazon as well as other websites. I was really excited to get a look at this Bible since my son has enjoyed Minecraft in the past with his friends and is looking forward to getting a game of his own one day. When he got a look at it, he was so excited. He thought it was the coolest Bible, and said I should let him have it, because he wanted to use it with his Minecraft games. This is a full Bible text written in a version children can read easily and understand. Along with the whole Bible from Genesis to Revelation, it also includes many full color illustration pages incorporating Bible stories and the game. For instance on the page with Noah's ark, there is a suggestion to build and ark on your game. Each illustrational page is double sided with a devotional, a Scripture passage, and a "what to do section" on each side. The "what to do section" suggests something to do on the game that relates to the passage and the devotional. Such as, Planting Seeds - the parable of the sower, and recommended growing seeds on your game, choosing the right soil, and taking care of the plants. This Bible is hard cover, has a dictionary at the end, and a page with some great Bible stories. 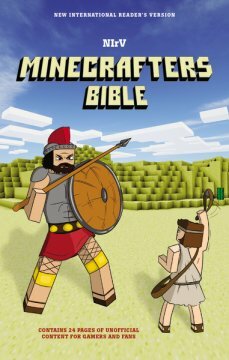 I am pretty sure a child interested in mine craft would love this Bible and hopefully it would encourage him/her to use the game in a productive and educational manner as well as grow them spiritually in the process. I received this Bible from BookLook and Thomas Nelson in exchange for my honest opinion. Sounds interesting! I love the fact that there are so many bibles out there based on different interest. Me too. Especially for kids. Its such a great way to get them interested in the word of God. I was pretty impressed with the way they incorporated the Minecraft game by challenging the kids to create structures and other things from the Bible stories.